A massive fire has engulfed the roof of Notre Dame Cathedral in the heart of Paris, shooting up its long spire and sending thick plumes of smoke high into the blue sky as tourists and Parisians looked on aghast. The cause of the blaze was not known but a spokesman said the whole frame of the cathedral was burning. As firefighters battled the blaze, part of the spire of the 12-century monument collapsed. Police in the capital said there were no deaths so far and the origin of the fire was unknown. 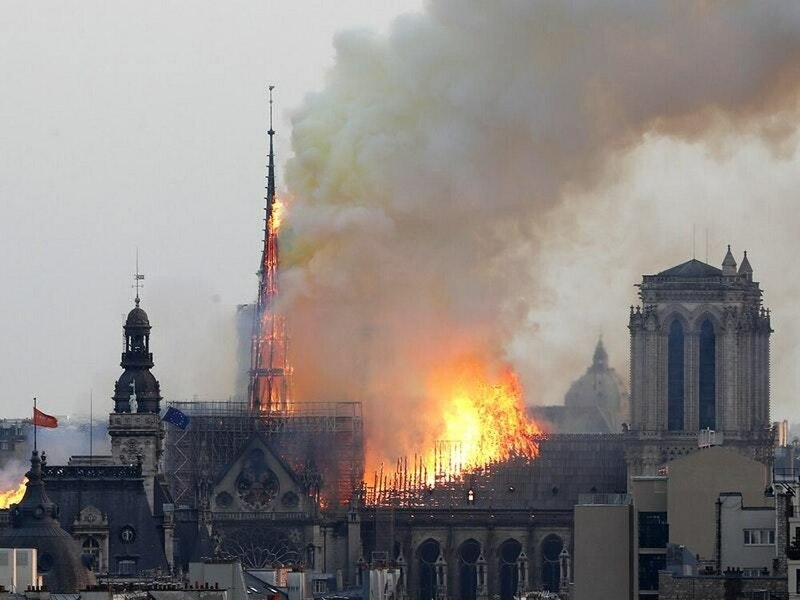 French media quoted the Paris fire brigade saying the blaze is “potentially linked” to a 6 million euro (£5.1 million) renovation project on the church’s spire and its 250 tons of lead. President Emmanuel Macron postponed a televised speech to the nation because of the stunning blaze and was going to the cathedral himself. His pre-recorded speech was set to be aired on Monday evening to lay out his long-awaited answers to the yellow vest crisis that has rocked the country since last November. Associated Press reporters at the scene saw massive plumes of yellow-brown smoke filling the air above the cathedral and ash falling on the island that houses Notre Dame and marks the centre of Paris. Mayor Anne Hidalgo said in a Twitter message that firefighters are still trying to limit the fire and urged Paris citizens to respect the security perimeter set up around the cathedral.